Normally, we live with our family until the day that we can finally take a stand for ourselves and live an independent life. Until then, we always see their faces when we wake up and go home from school or work agenda. We get to talk to them anytime we like and hear their laughter as we make jokes in our daily conversations. We get to spend time with them every day that we sometimes take their presence for granted. We fail to recognize how blessed we are to be with them until it’s too late and they have already departed from this corporeal world. A loved one’s death is one of the most painful moments that we can experience. It can be overwhelming sometimes that it creates a void in us. We don’t know what to feel; we don’t know what to think. Has my beloved really left me? How? Why? You keep asking questions even though you already know the answer. You can’t easily accept the fact that they have eternally rested. It’s the kind of truth that is too painful to swallow. But, despite the immense pain we feel, it is our duty and responsibility to give them a proper goodbye.You may also see card templates. We need to let the people close to them know that our beloved has departed. 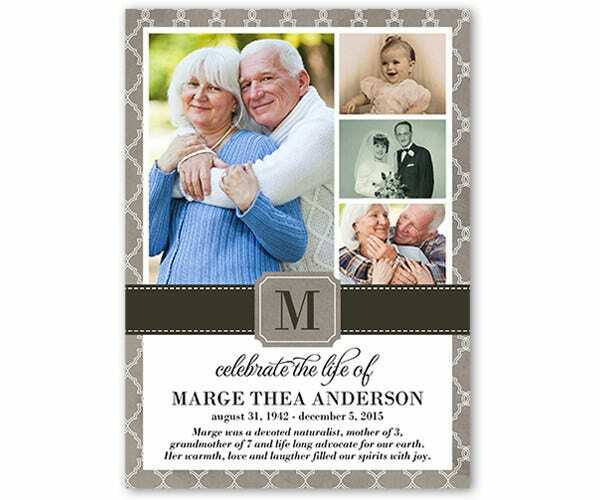 To properly do so, we need to send them memorial These card designs can vary from simple to vintage to stylish. 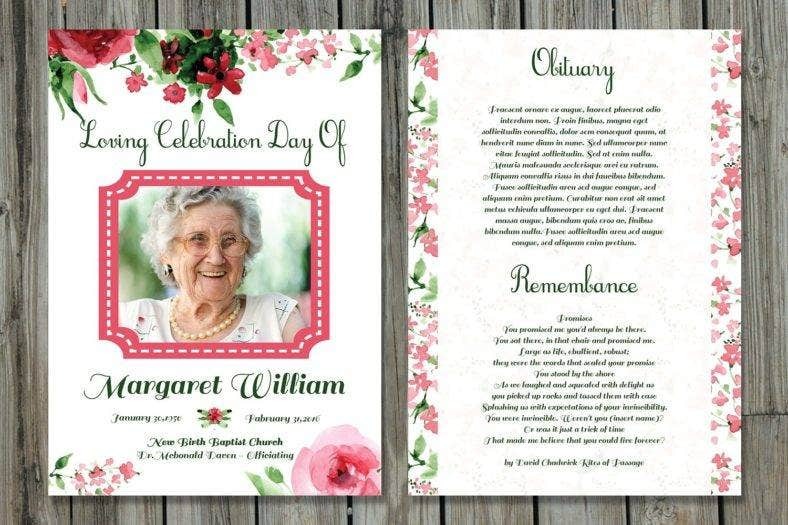 If you don’t know what to design your card with, we can help you by showing you a list of memorial card designs and templates. Read on and check them out! 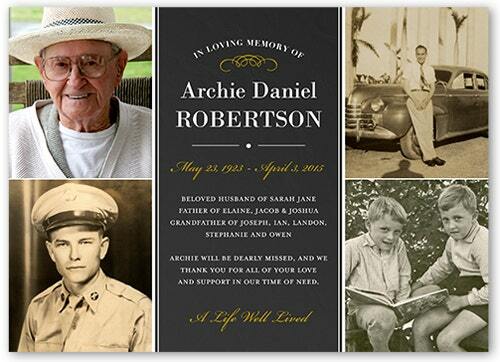 Arranging a memorial service while you are still mourning is almost an impossible task to do. But, despite it all, your desire to give your loved one the proper farewell rises above all. 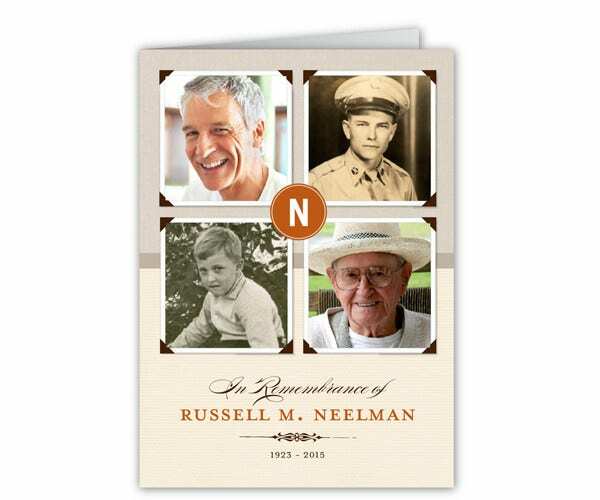 To help you with that, we have listed the information and contents that you need to include in your memorial card. 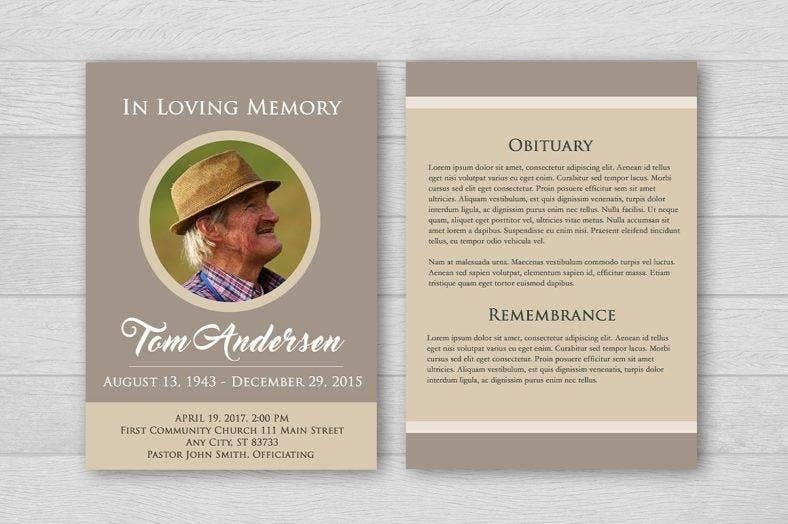 Clearly, the name of the deceased needs to be in the header of the funeral card design. Also, the date of birth and the date of death are standard pieces of information that are usually placed below the name. You can include the age to save you time from answering questions about it because there will definitely be people who will ask. Personal photo. Putting up a photo depends if the family allows it because sometimes, they choose not to as it will only cause emotional pain for them. But, most of the times, a photo of the deceased is included. Symbol. This is a great alternative to a personal photo. You can use a symbol that best represents who the deceased is as a person. If your dear beloved is the diplomatic type, you can use a dove for it. If he/she is the adventurous type, then you can put a photo that shows his/her favorite outdoor activity report. This can practically be anything as long as it reflects the personality and character outline of your beloved one. Other images. This could possibly be anything. 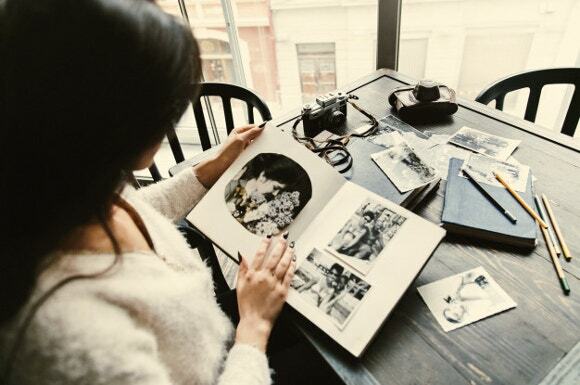 You can include images that closely relates to the person’s hobbies, favorite songs, food, and other images that connect with the deceased. There are cases where you still have enough time to say your sentiments to your loved one that you get to prepare yourself before he/she passes away. But, there are also times when they were just suddenly taken away from you without any warning. These untimely and unexpected deaths are what hurt the most. You never get to say your sorries or your goodbyes. You never get to say your “I love you’s”. You never get to say anything. You expect that you will see them again, but little did you know that it was the last time you saw them smile and hear their voice. It was one moment too soon, and one moment too late. 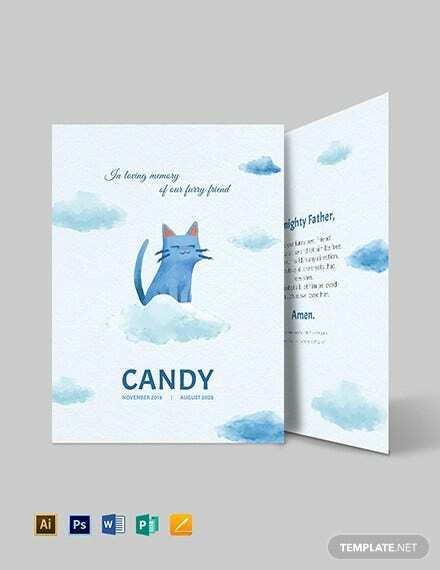 You may also like pet memorial card designs. Bottling all your thoughts and emotions may temporarily help you cope up with the situation. But, there will come a time that you need to release all of them. You need to let them go free. It’s up to you how you are going to express your grief. You can choose to distract yourself by keeping yourself busy at all times and not think about the painful experience. Or, you can face it head-on by writing all your sentiments into one personal message. Your dear departed may not be able to read it, but at least what you have held back for so long will finally uplift your spirits and help you recover from such a tragedy. 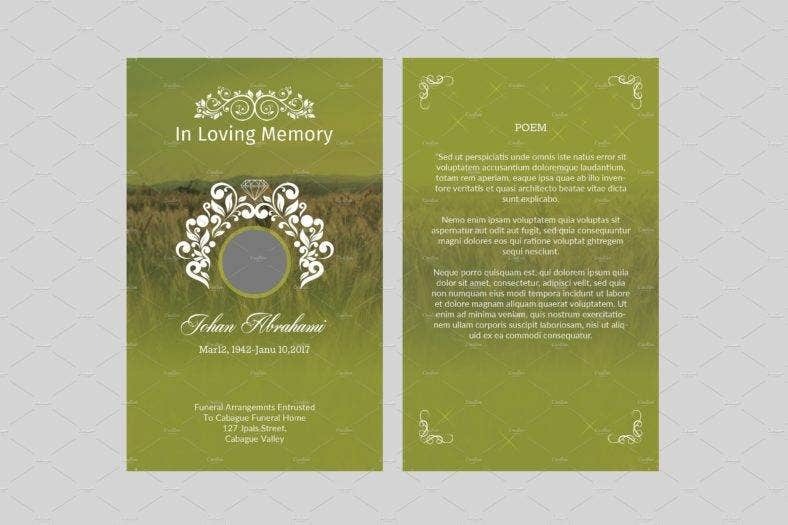 You may also see funeral greeting card templates. Write everything that has given you pain. Express your anger. Write how you hated yourself for not being able to spend time with them more when you had numerous chances. Confess your love even if you have consistently said it to your loved one. Say your regrets. Tell them that you have moments when you didn’t mean to hurl hurtful words at them or how you wanted to be with them but you chose not to. Write every line of the message as if you are talking to your dear beloved. Write with burning passion. 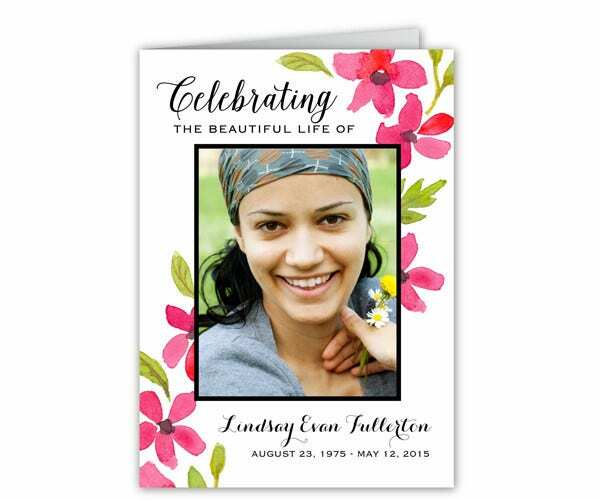 You may also see funeral cards. If you want to be more poetic for your message, then writing a poem is the way to go. Let your emotions take control of your hand as you write every piece of your innermost emotions. Feel every word. Use every adjective that you could use to tell the world how special your dear departed is. Let out every emotion. Turn your pain into beautifully weaved words of love, devotion, and admiration. Don’t worry if it is not the best poem out there because what matters most is that you were able to express your emotions in the most beautiful and artistic way possible. 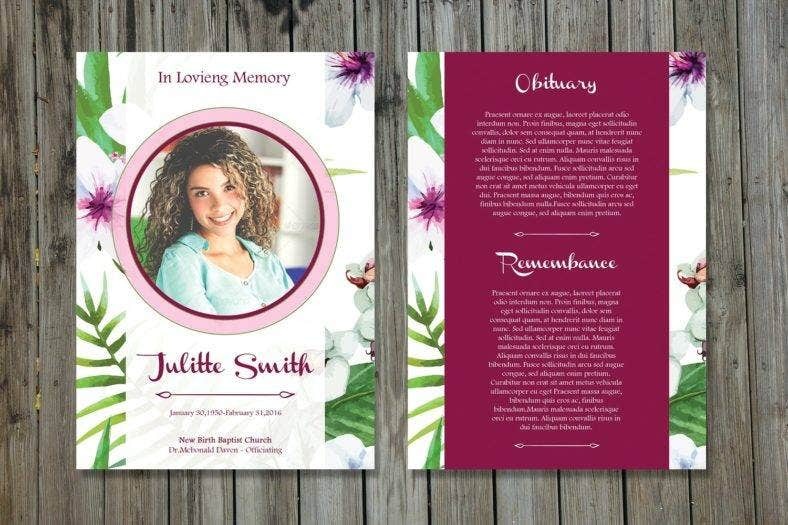 You may also see sample funeral templates. If you are having trouble with creating a poem, as an alternative, you can just include a poem that your dear departed likes if he or she has any. Or, you can let your family choose a certain poem that they think would closely relate to your loved one. This way, you can save yourself from the trouble of making one or asking someone to make it for you. You can explore the library or the Internet for millions of poems. With that said, you should narrow down your choices. Choose the poem that would perfectly reflect the moments that you had with your dear beloved or something that would fit with his or her personality and character. 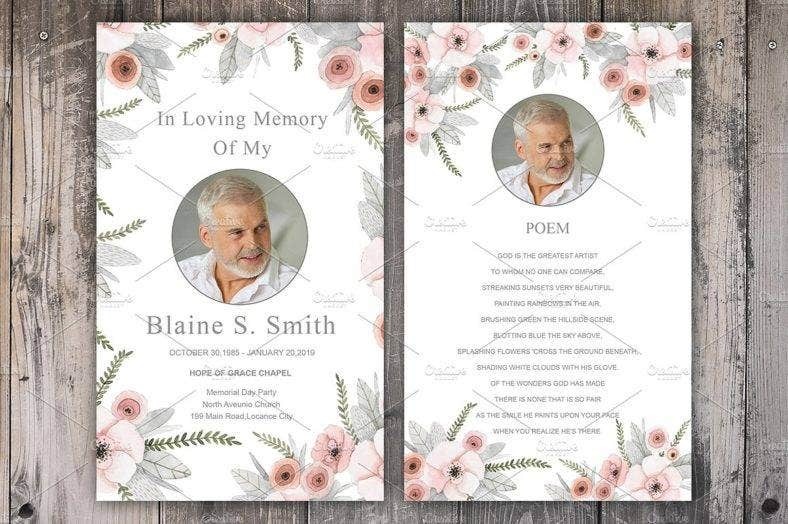 Another alternative for the kind of poem that you can choose to include on the memorial card is a poem that generally celebrates one’s life. Your dear beloved surely has lived a fruitful life no matter how short it was. So, why not celebrate it? Look at the bright side of life that your dear beloved has lived and reminisce the moments that you spent with him/her. Cherry pick special times that you saw him/her smile and laugh the most; recall the moments when they were able to put out the best versions of themselves. Write how happy he/she was when he/she was still walking on this earth. Create a poem that elicits happy vibes. Be happy for the life he/she has lived. 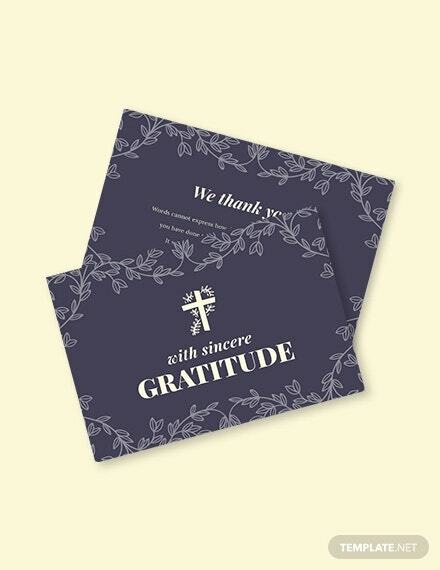 You may also see funeral thank you cards. People may have different religions, but, we can definitely agree that sending a prayer for your beloved is one of the most beautiful things that you could do before saying your last farewell. You can choose a prayer that celebrates the life of the deceased or you can create one of your own. A prayer that you create will feel more personal. Those who will be attending the funeral will feel more connected with you and they will know what kind of relationship you have with the departed. Give the most heartfelt prayer that the soul of the departed will be thankful for. 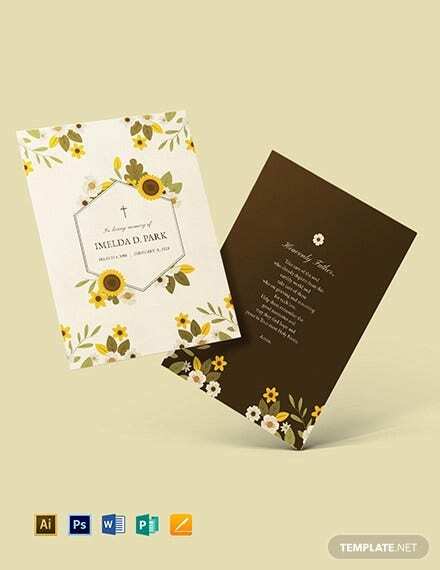 You may also like funeral invitation templates. 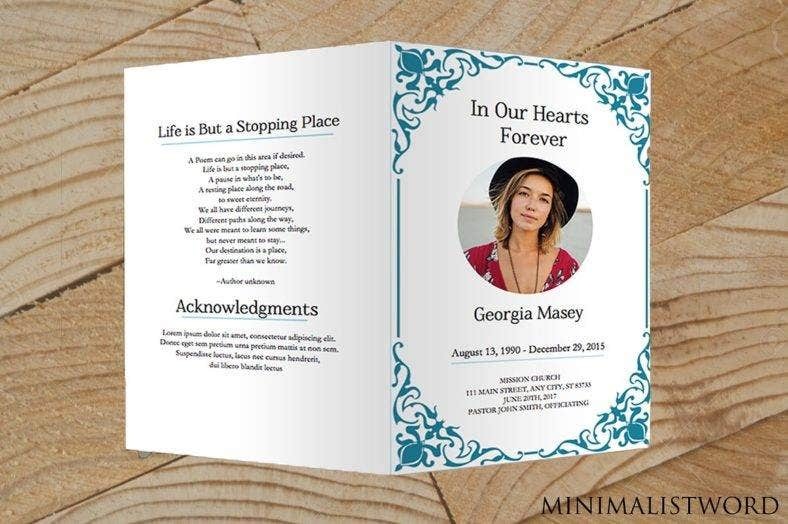 Also, the song lyrics included in the memorial card can be used as the song that people can sing with at the end of the memorial or funeral service. Singing the song that relates to your dear beloved will definitely strum the heartstrings of everyone who’s attending. It will feel like a tribute to the life of your dear beloved, and it may be painful to sing to but it will certainly make you realize that although he/she may have been gone, the memories you spent with him/her will eternally be engraved in your mind and heart. No matter the pain, you would be happy knowing that he/she has finally rested and is free from agony living in this cruel world. Even if the memorial or funeral service will end, the song will definitely linger and you can’t help but sing to it. The song will serve as an anchor to your memories with your dearly beloved. Every time you listen to it, you will be reminded of him/her. No matter where you go, no matter what time it is, as long as you sing the song, you will always be with your dear beloved in spirit. All of these messages will, of course, be discussed thoroughly with everyone in the family. You can choose either of them or you can do a mix of two or three. It depends on how you want to express your sentiments, and how you want it to be shared with everyone else. In the end, what’s important is that you get to convey your message with the thoughts and emotions that you have been trying to hide. It’s a great way of lifting some of the weight that has been pulling you down lately. You need to let everything out before you proceed with doing other important matters regarding the memorial. You need to have the focus and strength to push through this. And now that you have let everything out, you can proceed accordingly even if the pain is still there. 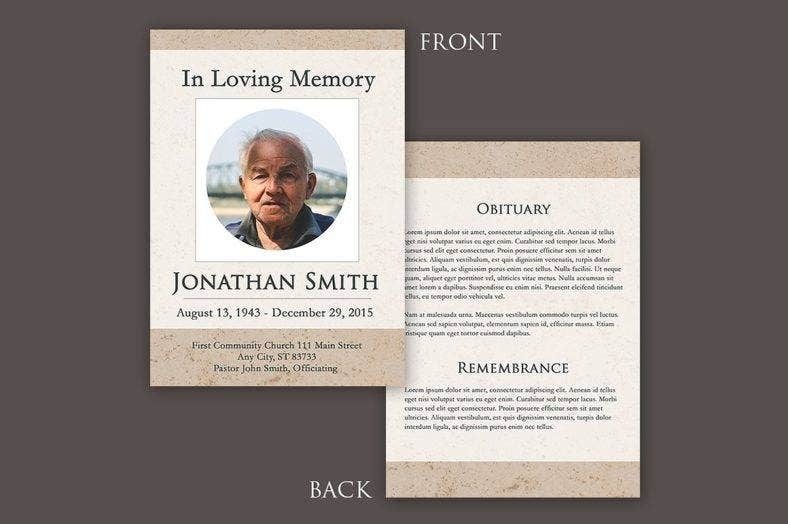 Why should you use these memorial card templates? 1. They are editable. The templates that we have provided are mostly in digital format, so expect that you can manipulate their designs. You can freely change any element that you want as the design templates are fully customizable. With a photo editing software program, you can put your personal touch on any of these templates and transform them into the design that you prefer the most. Make sure that the final design will reflect both the image and personality of your dear beloved so people will easily recognize it once they take a look at it. 2. They are downloadable. 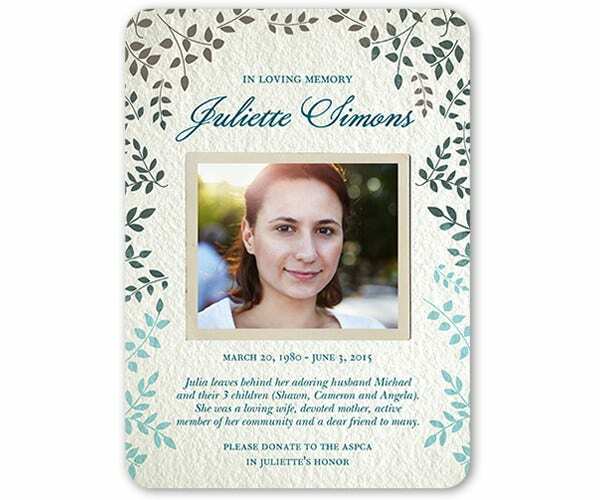 The designs for the templates are made by graphic artists and are shared with the world so they can be downloaded and/or bought by those who might need some help in their designs. You can download similar templates from graphic websites. Normally, premium templates come with a price, but they are not always expensive. If you are on a tight budget, there are other sites that provide free templates that you can download. 3. The quality is top-notch. Premium templates are not only associated with being highly priced but also with having excellent quality. Since you are paying for these templates, expect that their quality is the standard or even more than that. There are templates that might go over your budget, but they are priced that way for a reason. 4. They offer an array of impressive designs. Not all of us are creative, and even if some of us are, there will often come a time that we run out of ideas to use for the free designs. These templates are ready-to-use in case that moment comes. Or, if you insist on creating your own, you can use these basic templates as inspiration for your work. This way, it will be less stressful for you in choosing a design or creating one. Have you found the perfect design? Reaching this section of the article must have been such an accomplishment as it was probably painful for you to look at the designs and be reminded of your departed. With that said, you should take a moment to pause. Breathe in, breathe out. Calm yourself down and try to push back those tears for a while. 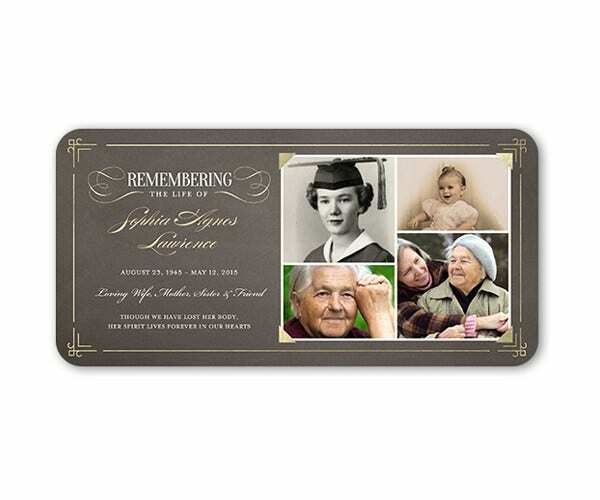 Right now, you have important matters to tend to such as choosing the design for the memorial card. Clear your mind so you could make a proper decision. Let your emotions sit back for a while. 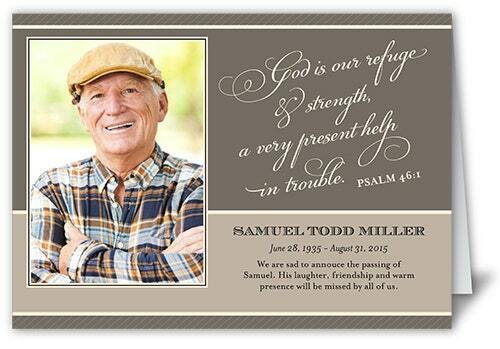 You may also like pet memorial cards. 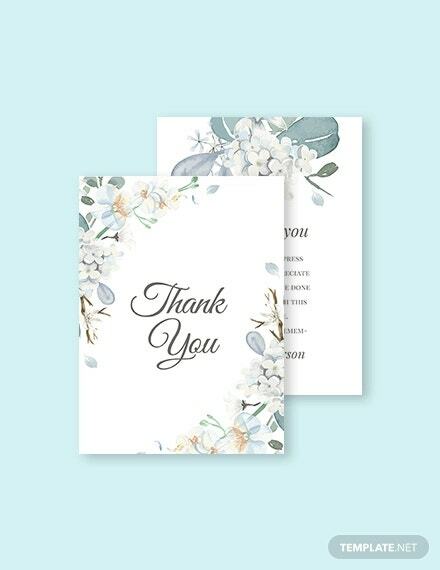 If you have noticed, these designs range from simple to vintage to sleek. Choose the one that you think would best reflect the personality and character of your dear beloved. 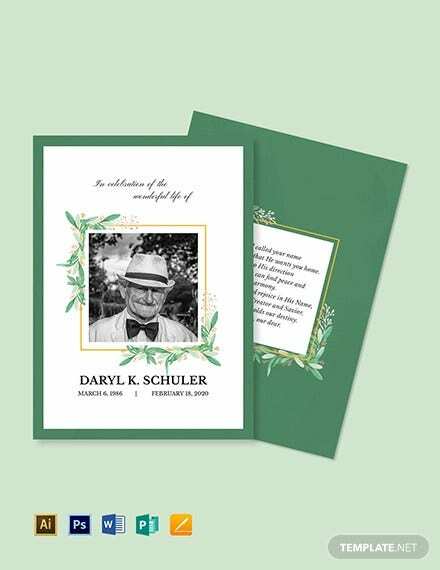 Those who will attend the memorial service will definitely be happy to see that even on the memorial card, your dear beloved still has his/her presence on it. Once you have decided which one to take, you can freely edit or change any element of it because these templates are mostly customizable. And once all the changes are applied, you can now print the card so you can start distributing them to the people close to your dear one. 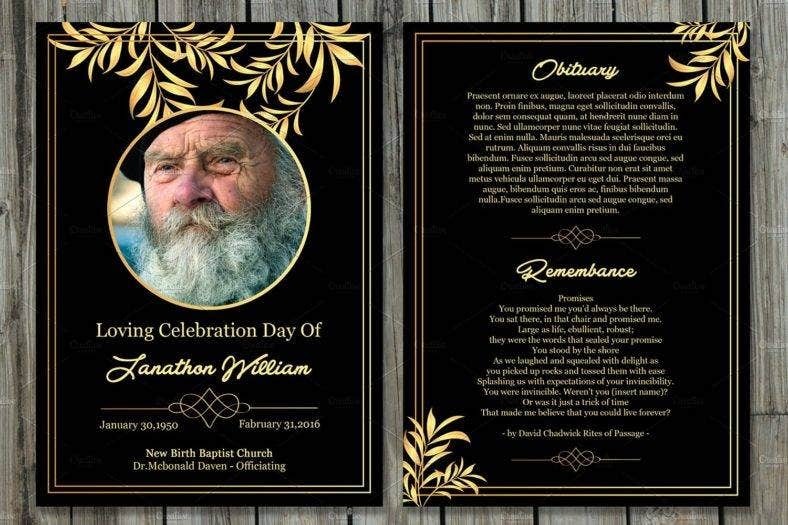 You may also like obituary card templates. Losing someone is indeed a very painful situation to experience, but if you look at it the other way, it can also mean that he or she has rested and is liberated from the further pain that life has laid upon his or her life. Looking at the other side makes you think that death can sometimes be a blessing in disguise especially those who have suffered enough. It’s assuring to think that your dear departed soul is happy wherever it may be right now. No more pain, no more sadness, no more suffering. His/her life may have already ended, but the memories of the moments that you have spent together will perpetually reside in your mind and heart. You may also like funeral prayer cards. 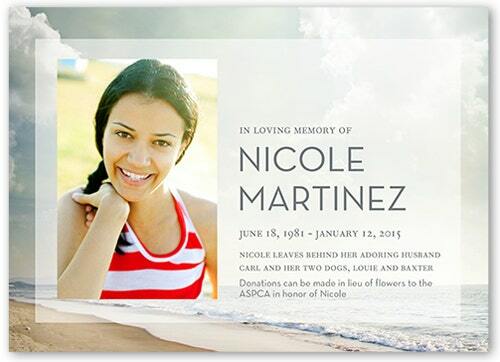 We offer our sincere condolences to you and the bereaved family. May your dear beloved rest in peace.